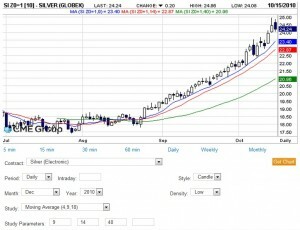 The December silver futures contract continued higher in trading once again yesterday, ending the silver trading session with a narrow spread up candle, but with a deep shadow to the upper body, as the commodity just failed to breach the $25 per ounce region before pulling back later in the session to close marginally below the $24.50 per ounce price level. As such, the weak candle hinted at a possible short term retracement for the metal, and indeed in silver trading today, the commodity has fallen slightly to trade at $24.24 per ounce having once again failed to breach the $25 per ounce price earlier in the day. 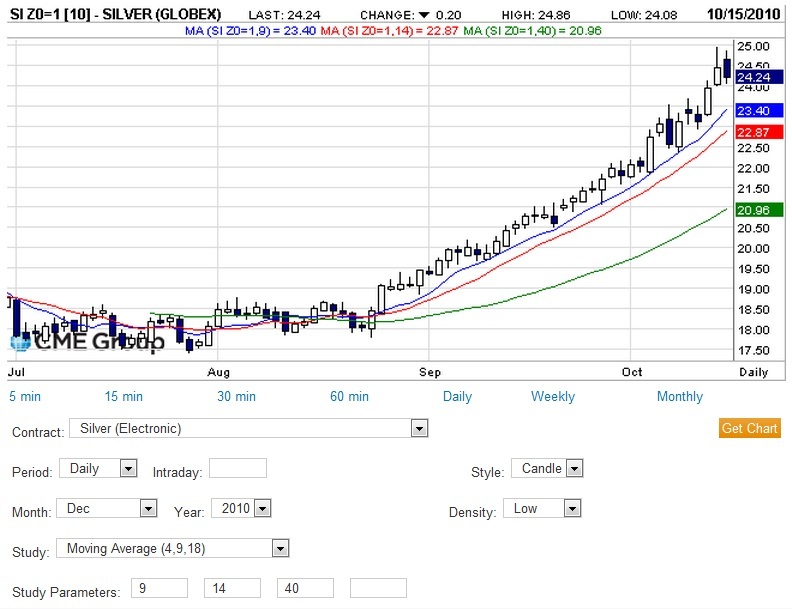 However, despite this short term signal the outlook for silver futures remains firmly positive with both the 9 day and 14 day moving averages continuing to point sharply higher and offering solid platforms of support for the trend, with the 40 day moving average sloping higher to add further weight to the move. From a fundamental perspective silver continues to gain, both from the pull through effect of gold, and also the continuing positive sentiment for equities at present, which are continuing to gain, as we move deeper into the US earnings season. The question many analysts are now beggining to ask is how much longer this bullish trend for commodities in general, and metals in particular can continue, before the ‘bubble’ of the last few months comes to a shuddering halt. All I can say at present is that the current trend remains firmly established and until we see a clear breach of the moving averages, with an associated shift in sentiment then the present trend looks set to continue for the time being, with $26.50 per ounce my short term target for the industrial metal.